Nutzen Sie unsere mehr als 60 jährige persönliche Erfahrung im Energiemarkt. Energy procurement is increasingly becoming a strategic challenge for companies and institutions. Price developments, the energy transition, market development, availability, political influences and technologies will constantly change and have a lasting effect on the market. For this reason, it will be essential to strategically build up the energy procurement in addition to an optimal pricing policy, and you can build on our many years of expertise. In times of energy transition, a secure, efficient and efficient energy supply is an increasing challenge for industrial companies. The goal of a technical consultation should always correspond to the economic minimum principle. The minimal principle is based on achieving a specific goal with the least possible use of resources. The economic principle is based on the fact that goods and production factors are to be used as efficiently as possible. Preventing rising energy costs is an important factor in ensuring that you can be a long-term, cost-efficient, and competitive company. With the introduction of an energy management system, you will also meet the requirements of the legislator for the reimbursement of energy taxes or the reduction of the EEG surcharge. The topic of grid connection is often neglected or not taken up strategically. Despite the strong regulation in this area, there are a variety of ways to optimize energy costs permanently. The task is partly more complex and complex than in other areas, but here can be permanent (up to 10 years) and noticeable savings potential. For this reason, we support you here from the first connection to the permanent optimization of your grid connection and transport costs in the electricity and natural gas sector. The complexity in the energy sector has increased significantly in recent years. As a consequence, this means that the success in reducing energy costs can only be achieved if it is maintained. Successful purchasing negotiations must also be reflected in the bill and all energy bills should be checked correctly and completely for compliance reasons alone. As the optimal tool we are offering you our En WebDesk at hand. The energy transition and other legislative influences of recent years have primarily influenced the tax and tax situation. These include the expansion of renewable energies, the electricity and energy tax, emissions trading, the promotion of CHP plants and grid expansion. As a result of this development, the share of taxes and levies, especially in the electricity sector, is now more than 50% for many companies. Especially for companies in the manufacturing sector, this development has led to a continuous increase in energy costs despite considerable efforts and investments in the area of energy efficiency, and despite continuous improvements in the energy purchasing sector. Energy has become a strategic asset. Today, this is reflected by turbulent energy markets, an increasingly stronger focus on efficient energy use and the increasing importance of renewable energies in the provision of energy. Energy management thus became an important management task. 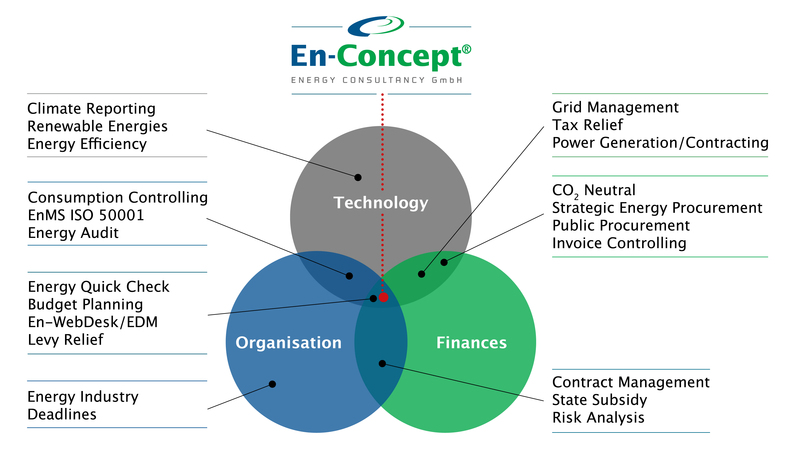 En-Concept® Energy Consultancy GmbH supports you purposefully in all areas of future-oriented energy management. Take advantage of our more than 60 years of personal experience in the energy market.